In the oft-conservative world of sports and sports punditry, Dave Zirin stands out for his fierce progressivism and pursuit of social justice. Sports columnist for The Nation and author of four books, Zirin focuses on race, wealth, freedom, and all sorts of other things no one in sports ever wants to talk about, lest they be a "distraction." Whatever your politics, Zirin's perspective is different and always worth listening to, even when/if you don't agree. 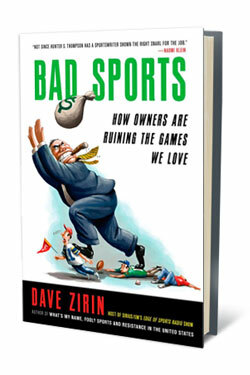 We talked to Zirin about his new book, Bad Sports: How Owners Are Ruining the Games We Love, how Mark Cuban is the best owner in sports (but still isn't that great), and whether there are any socially active athletes anymore. We've always found that the majority of sports fans try, sometimes to extreme lengths, to keep their personal politics, whatever they are, out of their sports. They imagine sports as a purer thing, unsullied by the ugliness of the real world. This is obviously a fallacy, and most are aware of that fallacy. But can you blame them for wanting to keep their real-world chocolate out of their sports peanut butter? That is to say: Is there a route to being a better, more satisfied sports fan while still knowing how all the sausage is made, and actively protesting its creation? There's nothing I'd like more than a world where sports were served to us à la carte. Kill the extra commercialization. Kill the insane ticket prices. Kill the public funding of stadiums. Kill the inability to watch games unless you have the correct cable package. But until that's the case, we have every right to try and reclaim sports from those who would make it alienating and unenjoyable. Most people love sports but hate what sports have become. We have three choices: We can take it the way it is and just drink more during games, we can stop watching altogether, or we can demand change. You have a chapter about the influence of George Steinbrenner in the book. There's a theory that the Yankees are generally more ruthless since he stopped being involved in the day-to-day of the team, that now they're more a traditional corporate entity, slyer, smarter. Do you agree? They're definitely smarter, but then they were always smarter when George was out of the picture. Let's remember that the Yankees won the most games in MLB in the eighties and didn't win one World Series. George was too busy trading young prospects like Fred McGriff and Doug Drabek for past-their-prime players. Their Torre dynasty of the nineties was built when George was suspended from the game. George might have traded a teenage Derek Jeter for Nolan Ryan if he was in charge. That said, they're definitely far less entertaining (from the owners box, at least). George Steinbrenner, while being a bridge to the past with his larger-than-life personality, was also a bridge to the future. This was the kind of man who was the model for owners from coast to coast on how to hold cities hostage for an endless flow of municipal funds or the team would be moved. If anyone ever seemed too big for New York, for better and certainly for worse, it was George. Do you think the James/Wade/Bosh teaming is a step forward for athlete power in sports? Undeniably it's a step forward for star athletes. Whether it's a step forward for the rank-and-file NBA player, the fans, or for competitive balance is yet to be seen. The new collective-bargaining agreement will probably have shorter guaranteed contracts, which will only make top free agents available at a younger age. LeBron's move in particular also is the ultimate expression of Curt Flood's legacy. I hated LeBron's choice. I hated the way he chose to go on ESPN for that idiotic special. I hated that he chose to diminish his own legacy. I hated that he chose to go to the worst sports town in the United States. I hated that he went to another man's team. But the key word here is "chose." LeBron James was exercising the rights of free agency exactly as had been fought for by sports unions over the course of decades. There was a famous quote from the young Ali when he said, "I don't have to be what you want me to be." We just wanted LeBron to be something — Michael Jordan 2.0 — that he simply didn't want to be. How do you see the NFL and NBA labor issues panning out? It seems like there are some loopholes that owners will try to close, and that they're willing to sit out whole seasons to make sure it happens. I've interviewed, over the last several weeks, both Billy Hunter, head of the NBA Players Association, and DeMaurice Smith of the NFLPA, and certain themes are abundantly clear. Both men are convinced the owners will agitate for a lockout no matter what they bring to the negotiating table. Both men are preparing their players and preparing public-relations campaigns to combat what will be aggressive moves by the owners to shut down the leagues if they have to. If you want a preview of how the unions will respond, I found this statement that Smith said to me to hold some clues: "If we get locked out, we have 30,000 people who work in our stadiums. They're locked out. The concession workers and the people who are parking cars in the sleet and the rain for a fourth or fifth job, they're locked out. The bars and the restaurants that rely on football, they're locked out. The families of our players that rely on the health care, no health care. I don't really look at this as a battle between millionaires and billionaires. I look at this as a battle between 32 people who can unilaterally shut down our game, and America who digs it." You talk about the beauty of the Green Bay Packers being publicly owned, and then explain why that can never happen again, in any sport. Is there an owner out there who IS doing it right? Or is at least close? An owner has one job and one job only: to protect the integrity of their sport and to protect the integrity of their teams. They have failed at this task in spectacular fashion. They are supposed to care for our games so we can pass them on to our kids and our kids' kids. Instead, we get insane ticket prices, price-gouging stadium deals, and nine-dollar beer. It's become an abusive relationship, between fan and sport, and every owner is complicit. If forced, I would say that Mark Cuban is great because he promotes his team relentlessly while never pretending to know more than his GM or coaches. At this point, that's the least we can ask. Are there any socially active athletes left? Do you think there will be more in coming years, as the Jordan era vanishes deeper into memory, or are athletes still only concerned with who buys their shoes? Absolutely. Let's start with Arizona. On Cinco de Mayo, the NBA's Phoenix Suns went where no American sports team has gone before: They took a political stand. The squad from Phoenix took the court in their playoff game against the San Antonio Spurs, wearing jerseys that read simply "Los Suns," coming out as one against Arizona's Senate Bill 1070, aimed at criminalizing anyone suspected of being an undocumented immigrant. This was the first time in U.S. history that an entire team — from owner, to general manager, to players — had expressed any kind of unified political stance. The audacious move by the Suns was simply the most public manifestation of a low-frequency sea change in the world of sports, where more and more athletes are using their hyper-exalted Brought To You By Nike platform to say something more than "We just play one game at a time ... good Lord willing." Already, two dozen MLB players have spoken out against the bill, including your favorite, Albert Pujols, who said, "I'm opposed to it. How are you going to tell me that, me being Hispanic, if you stop me and I don't have my I.D., you're going to arrest me? That can't be." This was only the latest example of a sports world unable to contain its narrative to the sports page. It seems now that every time there are people on the march off the field of play, it finds echo in the supposedly apolitical world of sport. Last fall, in the weeks before a 200,000-person protest for Lesbian, Gay, Bisexual, and Transgendered rights, two NFL players — Pro Bowler Brendon Ayanbadejo and New Orleans Saints Super Bowl hero Scott Fujita — came out in favor of LGBT marriage equality. A new generation of "Jocks for Justice" are losing the apathy and speaking out about the world. NBA players like Nash, Etan Thomas, and Joakim Noah raised objections against the U.S. war in Iraq. NFL players like Scott Fujita and Adalius Thomas did the same. Even Ultimate Fighting champion Jeff "Snowman" Monson hands out anti-war pamphlets on his way to the "Octogon" and was out protesting at the 2008 Republican National Convention. Athletes don't live on Planet Jock. They are part of this world and the level of crisis right now in the United States is something that has even breached the citadel of American sports. Recession. War. Immigrant bashing. Oil spills. These are hardly the salad days. Jordan's ascendancy took place during the so-called "vacation from history" in the nineties. Well, history has returned with a vengeance, a vengeance severe enough to puncture the moated citadel of professional sports.